We all know that to keep things interesting it’s best to mix it up. 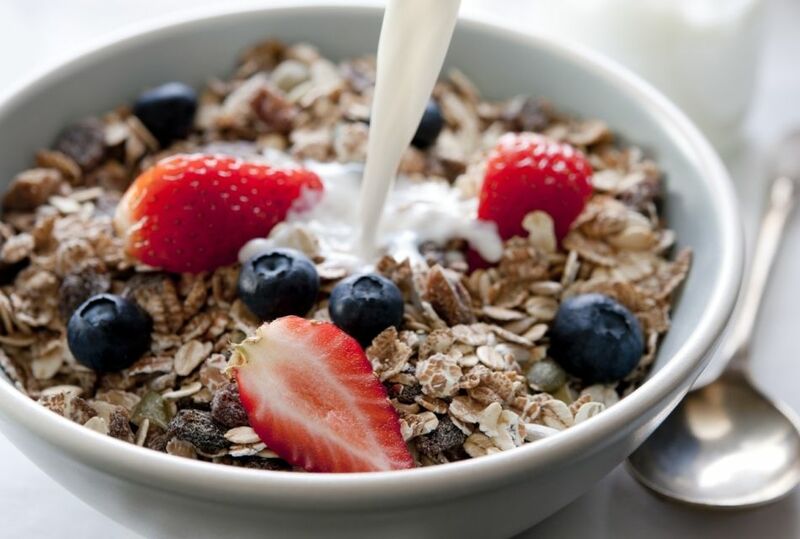 However it’s not so easy with your morning cereal especially over the summer months when you might not want to have porridge which can be creatively topped with a multitude of fruits, nuts, syrups and seeds. Muesli is a great option because it gives you the freedom to build on its existing natural base with additional toppings. White’s Organic Oat Muesli Four Seed and Fruit & Nut Goodness is a great base for getting creative and what’s more it contains absolutely no added sugar and is wheat free, perfect for you vegans. Let’s take a closer look at all the wonderful ingredients in our organic oat mueslis. Firstly our mueslis are 100% organic and why is that so good. Well, organic food is produced using environmentally farming methods, working with nature to produce naturally wholesome and nutritious products. All of the ingredients in our mueslis are of organic origin and have been carefully selected for their powerful nutrient content. Being organic they contain higher percentages of the many nutrients that are so beneficial to our health such as fibre, iron, protein, magnesium. We don’t pack our mueslis full our wheat and barley flakes but, with our award winning jumbo oats which give it a wonderful texture and bite. Grown by our trusted network of 30 British Organic Growers, we trace every oat from farm to bowl so you can be guaranteed the best quality at all times. Renowned for their wonderful flavour and taste, nuts are one of nature’s most powerful antioxidants, vital for repairing tissue and cell damage caused by free radicals and also in the fight against inflammation. Nuts are also great sources of energy containing unsaturated fats that can help lower cholesterol as well as being rich in healthy fats, vitamins and minerals. Did you know that dried dates contain all the benefits of the fresh berry just in a concentrated form and by providing dates in this form you only need to eat a few to obtain the good sources of nutrients available from dates. Dates are high in potassium and a key source of magnesium, zinc and selenium. They help promote regular bowel movement as well as controlling blood sugar levels through the steady slow release of sugars. Coconuts not only provide a natural sweetness but they also increase the good HDL cholesterol in your body. Though tiny in size, seeds are a powerful and beneficial nutrient packed full of protein, iron, fibre and omega 3 fatty acids. Sunflower Seeds are a wonderful antioxidant promoting healthy skin and hair as well as an excellent source of b vitamins. Pumpkin Seeds provide a great source of b vitamins and other key nutrients such as magnesium and iron and zinc. Also high in protein, they help keep us fuller for longer and avoid any unnecessary snacking. The high levels of omega 3 fatty acids actively work to lower unhealthy cholesterol in the blood. Linseeds like oats are high in soluble fibre which helps create a feeling of fullness in the stomach. However the main benefit of soluble fibre is it contains beta glucan which has been proven to lower cholesterol. Linseeds are also a great source of omega 3 fatty acids which contributes to promoting healthy eyes and joints. Chia Seeds, the trendy new seed on the block and deservedly so, owing to their high fibre and iron properties. What many might not know is that chia seeds are also a rich source of calcium for healthy bones and teeth.